Welcome to my blog which is all about good living. Please note: text and images are copyright Lucy Bridgers unless otherwise stated. As a north Londoner, I felt a bit sad when I heard that Trojka in Primrose Hill was closing. It had real personality and an earthiness that's become rare in a part of London that has become self-consciously cute. Anyway, I hadn't thought about it much until I recently heard about Greenbury Café which has opened on the site. The name comes from the fact that Primrose Hill was once known as Greenberry Hill after the notorious hangings of Green, Berry and Hill who had plotted against Charles II. What made my ears prick up was the realisation that Morfudd Richards is the force behind the Greenbury Café. 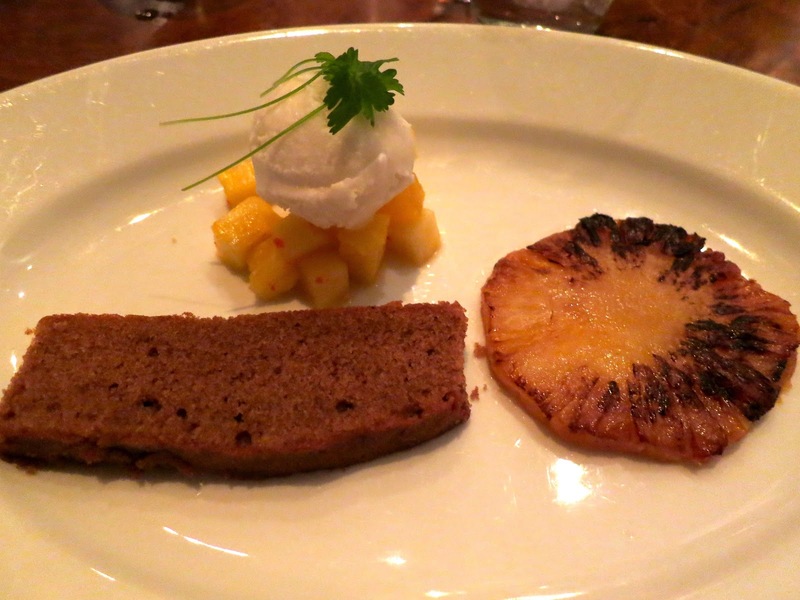 Over the past couple of decades or so, Richards has been closely involved in the London restaurant scene, working at Marco Pierre White's Harvey's and for Chris Corbin and Jeremy King at The Ivy and Le Caprice (Fay Maschler's piece about her here reads like a potted modern history of the London restaurant scene). She went on to open Lola's in Islington in the 1990s where chefs included Juliet Peston (sister of Robert) and Hywel Jones. I lived nearby and just loved Lola's for the way it combined excellent food and drink with a warm, relaxed and welcoming atmosphere. Unlike many restaurants at the time, it was never up itself. So, I was delighted to hear about Greenbury Café. It's open all day and the eclectic menu takes in British delicacies (even from London), interesting global dishes (Imam Bayildi, kitchari), charcuterie and comforting classics like eggs benedict, salt beef sandwiches and steak and chips. The drinks list is equally varied, offering an array of sherries, craft beers, imaginatively chosen wines and proper grown-up soft drinks. The coffee sounds great too, using a specific blend called 'Baron' from Climpson and Sons. 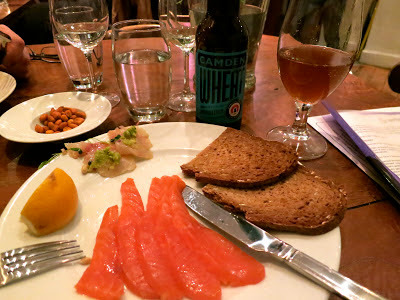 For my starter I really got into the local vibe and had Stoke Newington smoked salmon with soda bread and Camden Wheat Beer (see pic above). You'd never expect it, but this turned out to be a terrific combination. My friend Neil had sea bream ceviche, passion fruit and avocado – zingy and appetising and fabulous with Tim Adam's Fairfield Block Single Vineyard Semillon. I stuck with fish for my main course – roast cod, herb and olive quinoa, tamarind purée, and the Semillon hit the spot again. Neil chose a lamb dish from the daily specials and a glass of gutsy Jumilla. We couldn't resist pudding, so Neil had some of Morfudd's home-made vanilla ice cream with Pedro Ximenez poured over and I had roast and raw pineapple, pain d'épice, coconut and limeleaf sorbet (with a glass of Arneis Passito). All excellent. I've been a keen cook since childhood and happily amuse myself for hours fantasising about food, shopping for food, cooking and then obviously eating it. For two decades my professional life has been dominated by wine and food. Now I have a young daughter who, so far, also shows a keen interest in food and enjoys spending time with us in the kitchen.